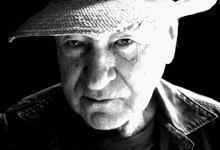 Jonas Mekas was born in 1922 in Semeniskiai, Lithuania. He currently lives and works in New York. In 1944, Jonas Mekas and his brother, Adolfas, were taken by the Nazis and imprisoned in a forced labor camp in Nazi Germany for eight months. After the War, he studied philosophy at the University of Mainz from 1946-48 and at the end of 1949, he emigrated with his brother to the U.S. settling in Williamsburg, Brooklyn in New York. Two weeks after his arrival, he borrowed the money to buy his first Bolex 16-mm camera and began to record moments of his life. He discovered avant-garde film at venues such as Amos Vogel's pioneering cinema 16, and he began screening his own films in 1953. He has been one of the leading figures of American avant-garde filmmaking or the "New American Cinema," as he dubbed it in the late '50s, playing various roles: in 1954, he became editor and chief of Film Culture; in 1958 he began writing his "Movie Journal" column for the Village Voice; in 1962 he co-founded the Film- Makers' Cooperative (FMC) and the Filmmakers' Cinematheque in 1964, which eventually grew into Anthology Film Archives, one of the world's largest and most important repositories of avant-garde films. His own output ranging from narrative films (Guns of the Trees, 1961) to documentaries (the Brig, 1963) and to "diaries" such as Walden (1969); Lost, Lost, Lost, (1975); Reminiscences of a Voyage to Lithuania, (1972); Zefiro torna, (1992) and As I was Moving Ahead, Occasionally I saw Brief Glimpses of Beauty (2001) have been screened extensively at festivals and museums around the world. Recently, the Brooklyn Academy of Music and the American Museum of the Moving Image screened Letters from Greenpoint and the Mead Gallery at the University of Warwick, England, Monash University Museum of Art, and Australian Centre for Contemporary Art, Melbourne, Australia, held exhibitions for Mekas this past fall. In May 2006, the Hirshhorn Museum and Sculpture Garden, Smithsonian Institution, Washington D.C. held a lecture entitled "meet the artist" and screened Reminisces of a Journey to Lithuania. The Directors Guild of America awarded Anthology Film Archives a DGA Honors recognizing the center's dedication to preserving the art of cinema. In its annual selection of 25 films, Reminiscences of a Journey to Lithuania was esteemed by the United States National Film Preservation Board to be selected for preservation at the Library of Congress' National Film Registry. His films were also screened at Art Basel Miami and Mekas was honored at the Los Angeles Film Critics Association's award ceremony for his significant contribution to American film culture. Most recently, the Jonas Mekas Visual Arts Center was established in Vilnius, Lithuania and exhibitions will focus on art and film collections by Mekas and his friend and artistic collaborator George Maciunas, founder of the Fluxus art movement. Opening in late 2007, the Center will house an extensive avant-garde film archive and library and has plans to build a Fluxus Research Institute.